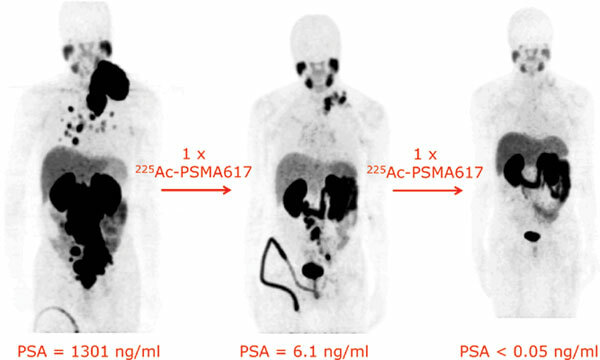 Background: Recent reports of the remarkable therapeutic efficacy of 225Ac-labeled PSMA- 617 for therapy of metastatic castration-resistant prostate cancer have underlined the clinical potential of targeted alpha therapy. Objective and Conclusion: This review describes methods for the production of 225Ac and its daughter nuclide 213Bi and summarizes the current clinical experience with both alpha emitters with particular focus on recent studies of targeted alpha therapy of bladder cancer, brain tumors, neuroendocrine tumors and prostate cancer. Targeted alpha therapy, alpha emitter, actinium-225, bismuth-213, nuclide production, clinical application.